In downtown Howell, there’s no better place to see and be seen from May through October than at the popular Howell’s Sunday Farmers’ Market. 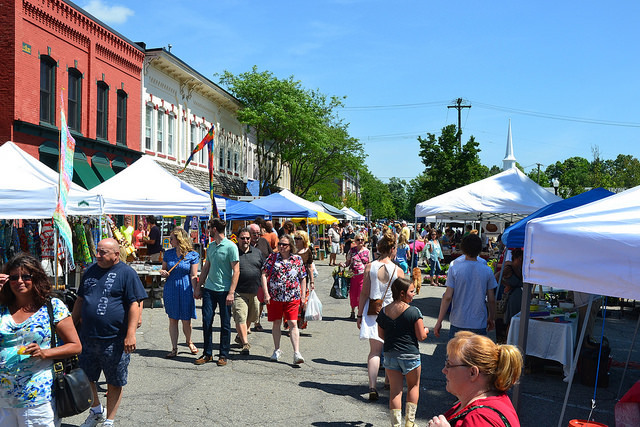 Howell chamber members can take advantage of all that exposure by renting the market’s featured business booth, located at the high-traffic crossroads of the market at State and Clinton streets. For just $50, members in good standing with the chamber get a 10 x 10 canopy, a 6-foot table and two chairs. Please note that there is no selling allowed in the featured business booth. Dates available for rental are Aug. 23, Aug. 30, Sept. 6 and Sept. 13. The Sundays in October are also available. Located adjacent to the historic Livingston County Courthouse in the heart of downtown Howell, the market features a mini-festival atmosphere from 9 a.m. to 2 p.m. every Sunday from May 3 through Oct. 25, and it showcases over 70 local growers, agricultural producers, artisans and crafts-people. Back as major sponsor of the market this year is First National Bank, with returning media sponsor the Livingston Daily Press & Argus. The market is hosted by the Howell Area Chamber of Commerce in partnership with the City of Howell, and Howell Mainstreet and Downtown Development Authority. If you’re interested in the featured business booth, contact Marie Paquette at the chamber at 517.546.3920 or email her at mpaquette@howell.org.